Mud Happy: UP Diliman Youth Leaders Inspire UP JMA KIDS to Plant their Living Legacy | FEED, Inc.
3 December 2016, Siniloan, Laguna. At the latest Students & Volunteers for the Environment (SAVE) tree-planting session held on December 3rd, despite the persistent rains and thick mud, fifty University of the Philippines (UP), Diliman Campus, youth leader members of the UP Junior Marketing Association (JMA) brought together their Kids Integrated Development through Schooling (KIDS) for a day out in the Sierra Madres mountain range at Siniloan, Laguna for a nature walk and talk focused on agro-forestry 101. Thanks to the overwhelming support from UP JMA & the KIDS program, which included some of the mothers of the KIDS encouraged to plant, the fifty participants completed the planting of 250 native Philippine indigenous Malaruhat wood trees, and an additional 200 on the occasion of FEED’s 41 years tribute of VIA MARE Founder and Chef Glenda Barretto – a FEED Living Legacy partner and Corporate Social Responsibility (CSR) Patron of the Environment; to restore part of the country’s 70% lost forest cover. 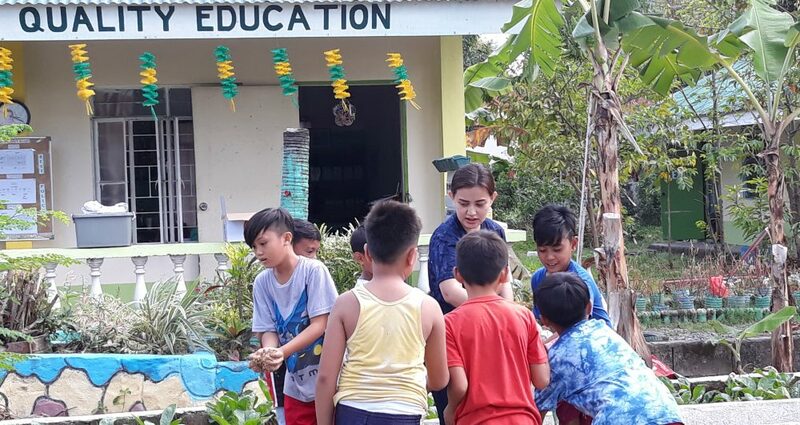 Led by Martina Shah and Samantha Mata, who initiated the request to FEED, UP JMA were key in making this project a reality for the KIDS – through a collaborative effort working with the University of the Philippines Los Baños (UPLB) facilitated by Forester Ben Arizala (former UPLB Head of the Land Grant Management Office) enabling all participants to re-establish their connection to nature. FEED and our foresters would like to thank everyone for being part of one of FEED’s main environmental conservation Living Legacy projects this year. The KIDS (Kids Integrated Development through Schooling) Program is the main beneficiary and social arm of the UP Junior Marketing Association. Every year, the UP JMA selects 40 intelligent, young kids from a poverty-stricken area of Barangay Loyola Heights in Katipunan, and belonging to the Tahanan ng Panginoon – Our Lady of Pentecost Parish, to become scholars under its KIDS program. The KIDS program assists these 40 scholars financially and provides them with a holistic development so that they may grow to their potential, despite their difficult living situation. Apart from this, each scholar is also given a monthly allowance subsidized by the UP JMA’s revenue-generating projects and events. Contact FEED to organise your own customised SAVE planting, on a date that fits your schedule. Contact: info@feed.org.ph or call/text +63 (0)917 552 4722 / 0905 554 7801.